It’s been a while since we’ve updated you with technical stuff. Our robots our moving – you know that. But what can they do? Everything’s still in progress but what’s important is that things are progressing and that we are moving forward. As our team’s experience grows each day, so do our robots. Last year, our robots had hands that could move and capture objects. This year, our robots have arms! As you may see on the video below, a prototype for an arm is fully functional and almost ready to be integrated into one of our robots! The arm with a hand will be able to capture game elements and move them around to the places robots want them to be. In the first part of this season we were situated in DevanaLabs premises. This was a very important part of the cycle as we had lots of planning, designing and learning to do in order to make great robots for the competition. It was when we were without a home, so to speak, that DevanaLabs was kind enough to let us use their offices and for that we cannot be more thankful. They enabled us to bring up new mobile platforms for our robots so now we have new and improved robots moving around. We improved our team organization, designed some of the prototypes for the mechanisms and talked a lot about the overall game strategy. But now, it’s time to roll up our sleeves and start rapidly making and improving the prototypes. When we look at the previous season, this part of the process will make us work over night and will get us louder than we usually are (be it because of the tools or because of the shouting due to sleep deprivation 🙂 ). To compensate for this, we decided to change our location to a place where we won’t bother anyone. APE.Robotics HQ v2.0 is located in the StartIt offices. They are a group of enthusiasts who strive towards creating a start-up community in Serbia. If you check out their website and blog, you’ll see that they’re not only trying but are pretty much succeeding! Recently, they successfully raised a KickStarter project dedicated to converting an abandoned old building into a start-up center! We already had a contact with StartIt, when they were kind enough to help us spread the word about MeetTheRobots event on their blog. A stork flew past our chimney! A platform for the small robot for the upcoming competition is now fully functional! There are still some minor fixes pending but it can already move around and is showing much more potential than the one we made last year. The new version of software is still in the development so the platform still can’t show its full power, but even with the code from the last year it’s working very nicely! While the ideas and prototypes for the mechanisms to be used have been in the process of design and production, the parts for the big robot’s platform have arived. This means that in a couple of days we’ll most likely have the big robot moving around as well! With a timeline like this, this year we’ll have a lot more time to use creatively and develop precise and practical mechanisms. A bit of luck, a bit of work and lots of testing will hopefully be enough for our robots to accomplish the given tasks and earn some good score! A very mechanical engineering week! We always like to get the development of mechanical parts out of the way as soon as possible. Fortunately this year it all went very smoothly! Our friends from Valmex were kind enough to donate us a ton of aluminum plates that we use for creating bases for our robots. After our guys from mechanical engineering team drew the shapes of the bases, our old friends from Limar that keep supporting us from year to year cut the aluminum for us using waterjet and provided us with almost fully ready robot bases! What remains is for certain components to be manufactured and printed that are used for holding the motors, the wheels, balancing pivot wheels etc. Folks from the Faculty of Mechanical Engineering from Belgrade are helping us develop parts that need precise processing while folks from SZR Bosna are manufacturing the tires for our little robot! The big robot will probably have its mobile platform done by the end of the week. The little robot will come a bit later but not later than the end of the month! It seems that we’ll have both robots mobile and ready for some action before the New Year so we’ll have a lot of time to focus on the algorithms and game strategy. Be sure to stop by and see the robots make their first steps towards the competition victory this year (we hope 🙂 )! Our little factory is warming up again! While waiting for many ordered components to arrive we are surely not wasting any time. Organizing the team for the new season is almost done and we are already moving forward with the design and implementation. Our software and electronics teams are designing the new system architecture and are starting with the implementation while our mechanical engineers are already printing out the parts! We have only to thank our friends from Voxellab for supporting us by donating us ABS filament for 3D printing. As soon as the materials arrived we couldn’t wait to test it out with our newest designs. They might not be perfect at the moment, but prototyping and iteratively improving the design is how we quickly get to good results and 3D printing is the perfect way to go! As we always like to point out, in order to be productive you need a good place for working. In our need for headquarters for this season DevanaLabs was kind enough to help us and give us access to their offices! It all started, again, with the MeetTheRobots event where the guys from DevanaLabs unfortunately couldn’t make it but were interested to meet us in person. So we met a few days after, talked about the problems both of our groups have, common goals and similar things so we told them about not having a place to work at at the moment and they offered to help us! Thanks to them we have now started working and will soon have bases for both of our robots for this season. DevanaLabs is located at the very center of the city. They themselves are working mostly with high-school students and are involved in some quite interesting projects one of which is their own home automation system! The premises contain a lab equipped with the cool equipment such as a 3D printer, oscilloscope and much more. There’s also a conf. room which helps us a lot with focusing our meetings. We’ll be staying here most likely until the middle of February when we should have both of the robots running, mobile and ready for some action! This Sunday we visited European Robotics Week event here in Belgrade, hosted by our friends from Mala Škola Elektronike who are also Eurobot Junior participants! European Robotics Week is a group of events hosted all over the Europe. It aims to highlight growing importance of robotics and the interest the folks from all around. During the five years of it’s existance it attracted over 200,000 people. Here in Belgrade, the event was held at the “Majdan” Culture Center. Along with the folks from Mala Škola Elektronike and us, the event was also attended by ETF Jinx team and the folks from FTN, Novi Sad with their “Marko” robot. 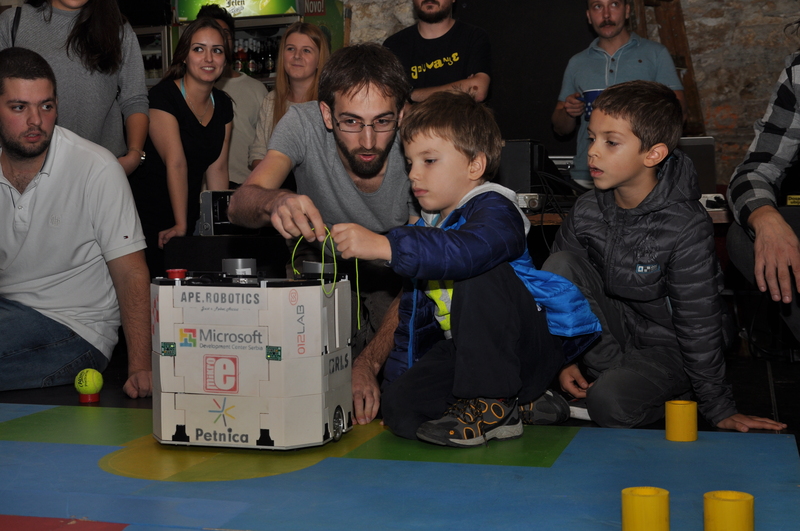 “Marko” is a robot who will hopefully be used to help the children with development difficulties! The event lasted for around two hours, kids were amused with seeing all the robots, some of them even helped our robot start by pulling the starting cord! We hope we interested them a bit with the robotics and motivated them to research on their own. Thanks everyone for being there and we invite everyone who is doing any robotics to participate in similar activities and events! Keep following our blog to see the new robots grow from the ground up as we’ll be sure to keep you posted! It is very difficult to find a person that doesn’t like to travel – everyone likes traveling! The trouble can be of course if you have no one to travel to. Luckily, this is not the case for us 🙂 During this month we were invited to five places to come and share our experience, hear some questions and opinions and meet some curious folks in person. It looks like “Meet The Robots” event we hosted recently made its impact. We visited three elementary schools located in Umčari, Vrčin and Vinča, a technical high school located in Zaječar and the Fab Lab seminar hosted at the Petnica Science Center. In all of the places we gave a presentation about the Eurobot competition, our experience during the past two years and hopefully motivated the audience to try and compete themselves at the Eurobot competition. Even though all of the places were generally concentrated with elementary school and high school students, there were lots of professors, adults and older people who were interested in the topic. After all, the robots are still something people don’t see every day, but we hope we’ll change that soon. Folks from Zaječar have been working with Lego robots for over two years and they will possibly make a team and compete on the Eurobot Open this year! Several elementary school students were also especially interested in the competition and they’ll maybe join the Eurobot Junior competition. We invite everyone to give them support and the help they might need. We’ll surely help them as much as we can. But that’s not all! A group of students attending the Applied Physics and Electronics seminar at the Petnica Science Center have organized a branch of the seminar at Kragujevac and have been working for a couple of years now. Some of them have attended the FabLab seminar we visited. They already started organizing themselves for the Eurobot Open this year and will clash their strengths with us and the other teams. Of course, we invite everyone to help these students as much as they can! When you annually participate in a robotics competition which every year has a new set of rules, you need a lot of new parts each season. Often, the parts are essentially different so mechanical engineers need to pass the whole process starting with an idea, over a prototype to a functional, working mechanism. The first time we competed at the Eurobot competition most of the mechanisms were made without a prototype version. At the time, our team had only one mechanical engineer so everything that satisfied a minimal functionality was accepted because there were piles of unfinished work. Also, the manufacturing was not always affordable. Last year we decided to make all the parts in a 3D printing technology using ABS plastic. We had a Makerbot Replicator 2X available, a larger team of mechanical engineers and a motto: “Guys, every idea goes to printing so we can try it out asap”. This created a fair amount of time that could be used for idea development which would instead have been used for purchasing scotch tape, cutting some planks, paintworks, etc… Literally, we had our own factory which produced everything our team thought of. Around three months after the first use of the printer, we had two of our robots autonomously moving across the playing field. Aside from the fast road from an idea to a functional part, the printing technology made the whole process a lot more fun. The quality of the printed parts was high enough that we decided to print almost all of the mechanisms, even the housing in the final phase, using ABS plastic. Thanks to everyone who came, we hope you had a great time. For those of you who couldn’t make it, don’t worry, we’ll definitely organize a similar event again very soon :). Of course, if you have any questions that you’re eager to ask and can’t wait for the next party, feel free to contact us any time and we’ll be more than glad to help you. See you soon! You can find more photos at our facebook page!